I'm sorry, I have to gloat for a moment... last weekend we were SO LUCKY to have Monika Elena take family pictures for us. She caught exactly what I hoped for with her digital and vintage polaroid cameras: magic snatches of light and an atmosphere of happiness. She's relocating down to Southern California and if you get a chance, she's beyond wonderful. 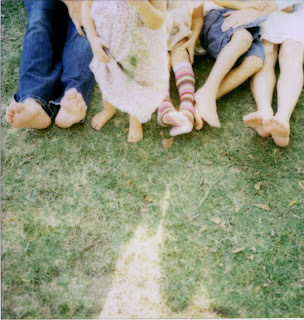 Monika, thank you so much for what are I'm sure the best family pictures we will ever have taken! 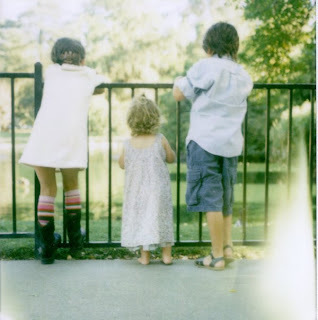 You can see more of Monika's polaroid wonderfulness here. I LOVE THEM!!! (can you hear me shouting this?) I think the one of you and S is priceless! And the kids look picture perfect! lynne we are kindred spirits today with our posts! In that first photo, are those children's boots? I'm hoping you say no. And I'm hoping you tell me what brand they are. I love them! yes, yes...i must know the boots also!! i LOVE these pictures. your style continues to exude from you even in your perfect choice of a photographer with a beautiful vintage flare. another reason why i am constantly drawn to your blog, ideas, and self. and yes, the one of you and your hubby is beyond adorable. oh, thank you for the boot compliments! they are doc martens, about four years old. i am not sure if they still are making them...? Doc martens, huh?? Who'da thunk it? Oh my goodness, these certainly are magic! Everyone photo is perfect! so wonderful photos! 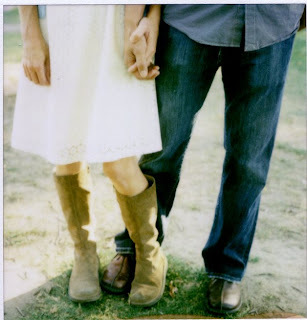 and i, too, love the boots! LOVE these pictures. What is her secret with the lighting? I heart your blog! The photos are GORGEOUS! Those photos are fabulous! I've been following your blog and thoroughly enjoy it! I was able to get the village frock pattern before it sold out again - yeah. The pic of the three kids is just PRICELESS!!! What great photos. I hate it, but I think I am going to have to hire someone if I want a decent picture. I like the one of you and your husband. Just had to let you guys know, I got the Village Frock pattern in the mail today. Such quick shipping! Thank you so much, can't wait to get started on it! You are so lucky!!! Great photos. Another reason to move to California! !